Find an activity where you feel comfortable changing patterns and trying new things. Maybe you add new ingredients to recipes, tinker with your bicycle, improvise dances, write stories, or create exercise routines that are uniquely yours? Anchor that feeling in your mind. Some people call that feeling play, others freedom, others mastery. We’ll call this your activity. Do you like doing your activity? Most people do. This is not accidental. Making your own patterns means a good level of mastery and comfort, and both feel pleasant. It also means the sense of belonging: the activity is yours, and you trust yourself with it. What makes activities yours? What builds this trust? We will talk about children and adapting mathematics for them, but think back to your activity as you read. Your friends and family, even have your dog or cat! Now think of multiplication. How can you make it familiar and validating for your kids, students, or yourself? The goal is for every single person to make mathematics their own. We want to see everybody playing freely, noticing and remixing patterns, and achieving mastery in personally meaningful ways. Making my own math sounds wonderful. But how would I know the difference between modifications and mistakes? First of all, you can and should make lots of mistakes in your private play with math. They don’t have to be glorious (Neil Gaiman): silly, big, or numerous work too. Some mistakes pass by without anyone noticing, and it’s usually okay. 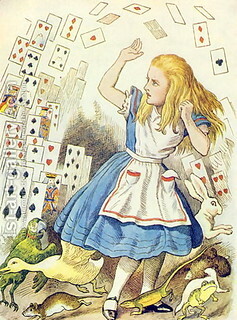 But if a mistake grows too big or too silly, or maybe sits in the wrong place, it visibly wrecks an area of your mathematics, like Alice eventually broke the Wonderland and woke up. Mathematics is a consistent endeavor. Its pieces must fit. Either you change the piece that does not fit, or you build another area of math to accommodate it. Want 2+2 to be 1? Sure! Imagine a clock on the planet where the day has 3 hours instead of our 12. If you make pieces fit, call it a modification. Call what does not fit a mistake. But there is always hope you can later make or find mathematics that fits that piece. This creation or discovery can make your mistake glorious. For sustained support, do what every math explorer does: peer review! Think, pair, share. First, think and play by yourself or within a small group. If you notice a pattern, discuss it with a peer. Then share the improved pattern with a larger group: a circle of friends and colleagues, or an online forum. It takes a village to raise a baby mistake into a glorious discovery. Since I was a child math was my favorite subject. I love puzzles and brainteasers. I like learning new languages(foreign or programming), baking fancy pastries and torts, sewing, smocking, designing new garments and many other things. Currently, my oldest daughter and I are writing an adventure novel about children traveling in time. We homeschool our children so I use a lot of my time for planning, researching and teaching. I am thinking about organizing an "Exploratorium" where children meet to get familiar with different math and science "ideas", analyze them and try to explore the situations where they can be used. Multiplication is a difficult concept for some children so I would like to find a lot of different activities which can help them to understand it. My activity is cooking. I love to cook. Saturday breakfast is always waffles or pancakes. Weekday breakfasts occasionally include a Dutch Baby pancake. I know those recipes so well that they are realms for play. There is always a secret ingredient or two. As far as validation -- it's a part of life I enjoy. It also connects back to family conversations and recipes, and to all the adventures I have had cooking that inform the choices I make now. I have a database of some great experiences making pancakes/waffles, and some instances where I failed, mildly or even spectacularly. So... yes, I want multiplication to be a place where my child and I play, and develop a depth of experience. We'll need to try lots of different things, including activities where I connect it to things we do and love. When I took my daughter to the park the other day, I dressed like a lady ( not like a ... Homeless person) for a change. 1. It was still going to the park with a good friend as usual. 3. I used to dress like that. My toddler loves bears, so doing bear multiplication is very familiar. Then we can make them houses and beds, she loves to make everyone comfortable. It is definitely represents swho she is. Housekeeping is the example that comes to mind. Like most people, I have done some of these tasks since I was fairly young. I am not employed right now, and my other major responsibility is caring for my children. I find it validating since it is a job which shows immediate results, and over which I have more control. Children have their own wills and rearing them is a long process. When I first took on this role, I found keeping up with basic tasks, while caring for an infant, challenging. I began reading, asking questions, and continued practicing. I slowly developed management skills and then other skills such as cooking. I again have an infant and find managing much easier than with my first, even though I now have more responsibilities. In applying this experience to multiplication or any subject, I think it will be helpful to allow ample time for learning before expecting the skill to be well developed and to introduce the subject in multiple ways. math I try to think as everyday problem solving. I like to cook for my family. I had a recipe I didn't have some ingredients so I had to find something else with the same properties as a substitute. To relate multiplication you have to triple or multiply times 3 to get the desired amount of servings. I love those quotes, especially the Gaiman! The activity for me that came to mind is teaching early childhood music classes. I've been doing it for 10 years and I enjoy it; I use some music I've written myself and some I've learned from various sources. One of my vocations is to equip and empower individuals to make music a more meaningful part of life, so teaching early childhood music fulfills this both through the young children and their parents/adults who come to class. I've used the setting as the context for my research through my university job, so I've gradually shifted the way I teach based on what I've learned in my research. Lots of areas of life come together (music lessons as a child, teacher education in undergrad, research in grad school and in current position) in the 45 minute classes. I respond to the children's energy, mood, interest, vocalizations, and the class unfolds in similar and different ways each week. Regarding multiplication, I can make it familiar and validating for my 7-year-old through connecting it to people. Since she was a toddler we've noticed her affinity for people (spending time with them and keeping track of them - who is in a class, which relative belongs with whom). Also to our home - we have lived here since she was an infant and the squares in the windows, tablecloth pattern, toys - are familiar and known. I'm not entirely sure about this question except to say that I am absolutely horrible at math. I'm not an idiot - I just like doing math as much as I enjoy dental surgery. I have never been good with algebra, flunked it time and again through high school, and barely met the required math credits necessary to graduate. Due to this massive lack of necessary credits, my then best friend and valedictorian suggested that I try geometry. He said something about me needing math to have some type of use in order for me to learn it. So I did. Straight "A's" the whole year. And I didn't even study it. Shapes and sizes make complete sense to me. Geometry worked for me because as it turned out I am very good at spatial arrangement. Show me a pile of objects and the space where it shouldn't fit and I'll be the first to fill that space with said objects and if there is any room to spare I'll almost certainly exceed most people's expectations. Just don't show me any algebraic equations. What's the take away? Not sure. But my 6 year old son just created his own 1 x 10 multiplication table recently, without any mistakes, by using equal sized Lego blocks and showing me the total if multiplying the starting number times something. He used some skip counting, addition, and whatever other pattern he could find but he wrote the 1 x 10 table flawlessly on his first try. I've sensed in him and his younger brother a spatial aptitude and if I can him to use that to his advantage perhaps he'll succeed in mathematics more than I ever did. Maybe we need to have step 2a: recall how you used similar strengths and values for other tasks. You packed big piles of objects into small spaces. Last week, I talked with a kid whose special activity is tennis - and what he values in it are live strategic decisions. "Like chess" he said (step 2a). That kid disliked his school geometry course, because it was all about philosophizing, that is, proofs. But I recommended GeoGebra: live dynamic action for problem-solving. This relates to sampling lots of different math (algebra, geometry, calculus) early on in life. My activity is playing music. It is familiar, validates who I am and represents my experience over time because it is something that I have done throughout all of my life. I can't ever remember a time when I didn't play having apparently started to play the piano when I was 3years old. Music is an integral part of me that I can't ever imagine being without, and I am confident experimenting with new ideas, new music, new styles, and am aware of how making mistakes can lead to deeper understanding of technique and many other aspects of playing, enjoying, and understanding music. Relating multiplication to this activity I would say that to make it familiar and validating to both myself and my daughter is to do it as much as possible in as many different contexts as possible, practising, making mistakes, improving, exploring, and trying to see and explore multiplication examples in everyday life wherever we can. This by it's very nature makes the topic more familiar and valid when it becomes a natural and accepted part of everyday life. I have lots of activities and they define me in lots of ways: I love knitting, cooking, crafting and mostly anything I can do with my hands. I find anything I can do, I try it and then I start creating new adaptations of it until I'm satisfied enough to look for another one. My activity is familiar to me, or should I say that my materials are familiar to me. It is the "1,000 chain" of golden beads that you find in most Montessori classrooms beginning in those for 3-6 year-olds together. The chain is prominently hung in the math area alongside the "100" chain. Children generally work with the "1,000" chain along a hall wall where there is room to lay the chain and place corresponding arrow tabs marked for 1-9, 10-90, 100-900, and 1,000. Where there is less space, you might see the "1,000" chain laid out in a spiral for the same exercise. You ask how my chosen activity represents my experiences over time. I fell in love with Montessori materials from the beginning. They just make sense to me. I understand there is a danger in "messing" with Montessori willy-nilly. However, over time I've come to believe Maria Montessori would be open to the exploration, engagement, and integration invited here. My activity is knitting. Knitting is not something that represents me over a long time. I am relatively new to it and for a long time I considered it something that I was not good at. However, I have enjoyed knitting so much more since I found an encouraging group that supported me in my endeavors, learned to fix my own mistakes, and found a project that really excited me. Also, knitting with higher quality materials -- better needles and yarn -- makes the experience that much more enjoyable. When read this task, I realized that I had neither altered a pattern before or made one up on my own. I decided to try. I knit a very simple doll dress for my daughter's doll without a pattern, using some techniques that were perfect and others that were not exactly perfect for the task. Although I was not 100% satisfied, it was still exciting to see the result. My daughter was very pleased. Not sure exactly what combination of familiarity and support will help my younger daughters with multiplication. I think that approaching it in a fun way -- and connecting it with something they already enjoy -- will be key. I think games can be a great method. I would love to make it more of a tactile experience as well, but I am not sure how to do that in an engaging way. My activity is cooking & baking. I grew up with a father who cooked creatively with international cuisine and a mother who cooked & baked by recipe. I was fortunate to also have my great grandmother in my home & she was a traditional southern cook & baker who judged her food by smell, taste, & consistency. I cooked along side them from the time I was little and branched out on my own fairly early, learning over time from my mistakes. Cooking & baking is very natural & comfortable to me. I usually go by recipe, but have become more comfortable & confident in changing up spices or trying substitutions. I creatively constructed a dessert by just pulling ingredients I had on hand that I thought would go well together & using a couple of different recipes that were similar to what I was hoping the end result to be as a general guide for amounts. Turned out well. Just hope I can repeat in the future. I try to find real life applications to teach math. My son is not interested in cooking, but I have worked finding games to help him learn. He has a very odd (to me) way of calculating math, which I am not against. It just takes so long to get to the answer and doesn't make it seem he has a true understanding. 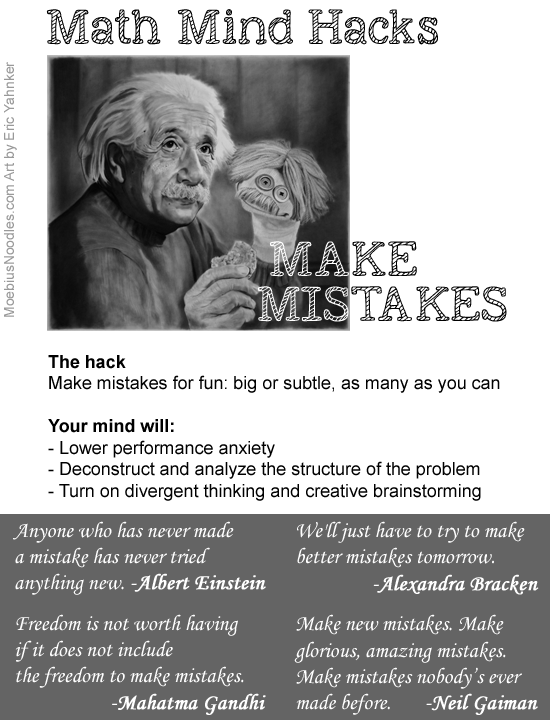 I understood why finding the activity with the Comfort level to allow for mistakes & learning is important. I just don't know how to find that activity for him. This was tricky. I ended up thinking about running. I have some established routes, however, something always varies. What I choose to wear, what I choose to listen to, the ratio of run:walk I choose, etc. Then I thought about exercise in general and how that varies. I may mostly run, with some bike rides and walking thrown in, maybe other strength training or yoga. Some days I need the comfort or my "go to" route with the default music, other days, I'm not going unless I can find something new to do. How this relates to learning multiplication escapes me. I feel like I need to trust the learner and go at her pace. But, I tell you, I don't think she ever wants to try to learn mulitplication again! I had a hard time with this question. I am fearful of mistakes and rarely deviate from a specified path, whether it be knitting from a pattern or cooking from a recipe. I would definitely say this is a challenge I need to work on and hopefully keep my children from being afraid of making mistakes. I'd say my activity is reading academic journals. I always enjoyed getting lost in academic journals for hours. I start to read one article and then find an interesting reference to another article and soon several hours have passed and I've reviewed a body of literature instead of one or two articles. Growing up I generally got along with everyone but never really belonged to anyone group because I was an elite athlete but also really enjoyed learning (I loved debating material with my teachers after school, tutoring, etc.) I guess allowing myself to explore academic research with no limits or external pressure (i.e., for intrinsic reasons) validates that academic part of me without judgement. And becoming familiar with large bodies of research facilitates connections with other people who embrace and validate this side of me as well. Overtime, reviewing literature has become less extrinsically motivated by things such as time, approval, my perfectionistic tendencies, etc. and more intrinsically motivated. I'm just starting to introduce multiplication to my five-year old son. And this question is a good reminder to embrace things that are familiar and safe to him (i.e., Lego, Pokemon, Minecraft, Bill Nye, and Hot Wheel cars-I would love any activities or ideas people might have for introducing multiplication using these materials/themes) when I'm introducing new concepts. Going forward, I'm going to explore focusing on using familiar manipulatives/examples/activities to introduce novel material that might be more challenging in hopes of creating a positive and safe association with the novel material, where as using creative/unfamiliar manipulative/examples/activities to expand understanding of mastered material. For me when you talk about validation and how to make math validating for my child, I see it as equivalent to fostering intrinsic motivation for math. I love Ryan and Deci's program of research that looks at creating a needs-supportive environment to fulfill children's basic psychological needs. If we create environments that foster their three basic psychological needs for relatedness (being connected to important others), competence (feeling that they are capable) and autonomy (feeling that they are at the origin of their behaviour) then I anticipate that my son will be intrinsically motivated to explore multiplication and that he will in turn develop a deeper understanding. I compose music, which is pretty much a process of arranging and rearranging tones and rhythms into beautiful and interesting patterns. I haven't really considered this before, but writing music is one of the few activities that I do where I feel at complete liberty to experiment and make "mistakes" in. That's probably why I enjoy it so much! As for teaching multiplication to my children. I think that the multiplication model scavenger hunt is a wonderful way to introduce and familiarize them with the concepts. I like the idea of pointing out how math is involved in so many everyday things- music, cooking, nature, legos etc. If they can grow up with the awareness and wonder that math is truly everywhere, then hopefully it will be intriguing and enjoyable to them instead of it being intimidating or a bore to them. @mrs123 can you describe the multiplication model scavenger hunt? I seemed to have missed that. I used to teach Pilates, yoga and fitness before I started homeschooling. I loved choreographing each class- it brought together my love of movement and my understanding of the human body, and the challenge was to create a class (and atmosphere) that would leave my participants energized, refreshed and relaxed. My twin sons love taking apart characters and storylines from Godzilla movies, videogames and Greek myths to create their own "live" role-playing games. Today they were quizzing each other on what the Twelve Labors of Heracles were, and it occurs to me that I can use that as a way to make one of them more comfortable with multiplication and factoring. They seemed to understand that there was something different about the first "set" of labors from the second. Cooking is the easy answer, PCB layout is another (I wish it were writing, but I go through big droughts of that). I've done each thousands/hundreds of times, and in both there are patterns that repeat themselves often. I'm awfully self-conscious but not self-aware enough to know how this validates, aside from the fact that PCB layout is part of my career, which both necessarily and positively forms a decent-size chunk of my identity. The way I do each is completely affected by what I've been reading lately, new things I want to try, etc. I've mainly used groupings of objects to explain multiplication, and in the last few months I've been trying to point out when I've been using math in general (and how and why) during every day life. I'm looking for other ways to make it familiar and useful before it feels like a chore in school. My activity is running. It's familiar because I have done it since I was thirteen. It is validating because it gives me peace and a reconnection with myself in nature. It represents my experience over the years because how, when, where and why I run has changed over time but I still love to do it. To make multiplication familiar and validating for my kids I will try to relate it to their interests. This would be fairies for my daughter and period table for my son. I am already thinking of ways to make it meaningful for both through play. My activity is writing- particularly writing for children. It is familiar because I have been reading (and loving) children's books since I was a child. It validates who I am because I have long thought of myself as a writer. (I listed this as a career goal in my fourth grade yearbook- which is fun to show kids at author visits.) It represents my experience over time because I wrote for over ten years before I got my first book published and I continue to grow and strive with each project and each revision. I think that I can make multiplication familiar and validating for my sons by drawing upon their strengths and interests. For my older son I can relate to his intense passion for Star Wars. We can also talk in practical terms as he budgets spending his allowance. We can also relate multiplication to his newly emerging note reading skills on the violin.